As expected, however, this explanation in a box leaves much to be desired for those of us who prefer to live in reality, instead of in a fictional world. On the other hand, we are learning something from NIST with this new report, and that is that when government scientists begin working for a political agenda above all else, there is no limit to the extent of deception that they will engage in. We also know that those who have produced the NIST WTC reports must now assume personal responsibility for the ongoing 9/11 Wars, and the millions of deaths that will result from those wars. NIST unveiled its WTC 7 report by making a new diversionary claim that it worked only three years on the investigation. But, to the contrary, we know that NIST began its work in August 2002 and decoupled its WTC 7 report in June 2004, after creating hundreds of pages of detailed reports for WTC 7. 3 The investigation ostensibly began anew in September 2005, after the report for the towers was sputtered out. Since then — other than for several “responses to FAQs” on the report for the towers — NIST has focused entirely on WTC 7. This means that, in full, NIST worked on its final explanation for the destruction of WTC 7 for at least five years, not three. NIST ignored all invitations from independent investigators to discuss or debate its findings or the alternative theory. NIST’s previous reports show no evidence that NIST considered alternative theories at all. Only one small disclaimer was made in the final report for the towers, and only after public criticism that no mention of alternative theories was made in the draft report for the towers. Those citizens who have successfully criticized NIST in public have lost their jobs for doing so. In other words, for NIST, avoiding problems means avoiding reality. In its new draft report based entirely on computer models, NIST contradicts its previous statements that suggested the building was destroyed due to fires caused by diesel fuel. This was despite the fact that, after several years of investigation, NIST still believed that the diesel fuel had made all the difference. NIST used its partner, Popular Mechanics , to communicate the diesel fuel theory. But like the previous explanations for the towers (remember the pancake theory? ), the final explanation for WTC 7 bears no resemblance to the earlier versions. NIST simply states in its new report that the diesel fuel played no role in the destruction of WTC 7. Of course, one third of one quarter only makes one twelfth, not 25%, but that was not important. As with the other official stories and exaggerated media versions of them, everyone knew that the goal for NIST and the Bush Administration was to make people stop thinking about it. That’s probably why so many of the official/media legends centered on food analogies. There was the pancake theory, and licorice steel, and the donut (WTC 6). And as with those, the “scooped out” phrase sent the blood running quickly from the brain to the stomach in anticipation of an ice cream treat. Celebrities like Denis Leary and Alan Colmes just ate it up and regurgitated it, as did Matthew Rothschild, Manuel Garcia, and every other pretentious supporter of the official conspiracy theory. It turns out that the “scooped out” nonsense was just more speculative deception. NIST knew that it would never be able to support such a claim with real science, as even the simplest evaluations disputed it. It was evident that the debris pattern at Ground Zero was incredibly asymmetrical, and NIST probably didn’t want to have to explain that anyway. But no one would believe that falling debris had “scooped out” so much of WTC 7, while the buildings immediately adjacent to WTC 7 incurred essentially no damage at all from the falling towers. Not even Larry could be so lucky. For those who were looking for easy answers, this new story means that the blood must leak back to the brain after all. But NIST is hoping that, by now, we’ve forgotten how to think altogether. Molten metal? What molten metal? There are many other reports of molten metal at ground zero, including quite a few from those who support the Bush Administration’s ever-changing fire-induced collapse theories. There are also photos supporting the reports of molten metal. 13 But NIST continues to ignore all of this evidence in its new report. Paper thin steel and sulfidation? What paper thin steel and sulfidation? Since the WTC report from the Federal Emergency Management Administration (FEMA) came out in 2002, the most intriguing aspect of the official stories given was the problem that the New York Times called “perhaps the deepest mystery uncovered in the investigation.” 14 This mystery referred to the extremely thinned pieces of steel discovered by FEMA investigators, and also by Astaneh-Asl. 15 These samples were found to exhibit sulfidation, and evidence of a eutectic formation, that could not be explained by any of the “fire-wise” professors. The fire-wise professors originally said this about the mystery, after seven to eight months of investigation. But that “detailed investigation” never got done, it turns out. And although NIST never mentioned any of this in its new WTC 7 report, Sivaraj Shyam Sunder did have to answer a question about it in his recent press conference. Sunder simply said that those fire-wise professors had thought more about it, and told the BBC that it wasn’t a mystery after all. We can be sure that those professors did think more about it. But without the detailed study they originally called for, the deepest mystery remains officially unsolved. Explosive thermite? What explosive thermite? An actual explanation for the sulfidation and extreme thinning of steel has been offered by independent investigators, and is fully consistent with the alternative theory that NIST has avoided all these years. The thermite reaction, available in several useful variations for the purposes of cutting steel, can explain this thinning and sulfidation quite readily. As we see with the explanation that took NIST five years to provide, no one could have possibly predicted anything like it. If the public reaction to this report were not so important to the future of all people around the world, this statement by NIST would be laughable. The destruction of WTC 7, never mentioned in the 9/11 Commission Report at all, was clearly a great mystery to government investigators since 9/11. But more importantly, after several years of investigation, it was still a great mystery to NIST and Sivaraj Shyam Sunder. Let’s take a look at what is suddenly so obvious about this new story, remembering that no actual scientific experiments are behind it, other than computer simulations that we will likely never be allowed to examine. In NIST’s computer, steel can do just about anything. We saw that in the report for the towers, where we were told that similar computerized office fires made floors sag, columns shorten, and large quantities of steel melt soften weaken. This time, we have what NIST calls a “new phenomenon” for structural steel, called thermal expansion. With this summary statement, NIST begins its explanation with a sleight of hand. The “initial local failure” is not a column buckling according to this new story, but is the displacement of a girder by means of the thermal expansion of up to five floor beams. It is there that we must begin our analysis of NIST’s new story, and if that is not realistic, then none of the remaining explanation for WTC 7 is realistic. We should begin with a fact described in one of NIST’s earlier reports on WTC 7. NIST now contradicts this earlier finding, in order to support the new story. For the thermal expansion story, this presence of shear studs holding the concrete floor to the beams and girders is important. The studs were 0.75 in x 5 in long, and were positioned every 1 to 2 ft along the beam or girder, according to NCSTAR 1-1. There were 28 of these studs for each of the five beams that supposedly expanded. NIST deceptively played down all those shear studs in its recent presentation, where a simple diagram falsely suggested there were only three studs for each beam. This is what the basic premise of NIST’s new story looks like, if we assume there was no seat welding, and all the shear studs have been removed, or have broken away from, the beams and the girder. As we can see, it appears NIST is telling us that the loose beams (only one shown) deflected the loose girder a distance of several feet. Even if we believe that WTC 7 was built in such a shoddy manner, is this hypothesis realistic? First, note that thermal expansion is not a new phenomenon, and structural steel was not just invented for use at the WTC. Such effects have been a possibility in all of the thousands of other situations in which structural steel was heated throughout history. So what enormous new difference did thermal expansion make for WTC 7? That is, the increase in length of the object considered is a function of the product of the coefficient of linear expansion (Î±), the original length, and the change in temperature. The coefficient of linear expansion for steel is about 0.000012 m/m/°C. Using the equation above, the beams could have expanded 0.019 m for every 100°C increase in temperature. Remember also that any thermal linear expansion would have been acting on the external columns of WTC 7’s east wall as well, because thermal expansion does not affect just one end of a beam. Whatever distance the beams pushed NIST’s critical girder, the same distance in bowing out of the east wall of WTC 7 would have had to occur, unless WTC 7 was a very unstable structure to begin with. Therefore, half of the total expansion length (0.01 m) would have affected NIST’s critical girder for every 100°C increase in temperature. For NIST’s new story, those floor beams would have had to not only expand linearly, but also break 28 high-strength shear studs, 2 seat bolts, 2 clip bolts (and seat welds), and then cause the buckling of a gigantic girder (which also had 22 shear studs) before the beams themselves buckled or even weakened. This is quite the opposite of what NIST says happened in the towers, where the official story is that the floors sagged dramatically. In WTC7, NIST now says the floors did not sag or weaken a bit, but remained fiercely rigid as high-temperature linear expansion caused them to wreak havoc on the surrounding structure. To accomplish the linear expansion, the beams first had to get very hot. NIST says that its computer models suggest that “some sections” of these beams reached 600°C. These extremely high steel temperatures would most certainly have resulted in the weakening of the beams, once the shear studs had been lost, allowing the thermal expansion to be relieved through downward sagging. This fact is supported by the experimental data produced by the Cardington tests, described in NCSTAR 1-9 (section 8.4.3), where much shorter floor beam spans experienced significant sagging. Therefore, this rigid beam linear expansion hypothesis is not realistic. In any case, although NIST does not state it clearly in the new report, a 575°C increase in temperature would have caused the girder end of the beams to experience a maximum of 2.2 inches of deflection. And if it were only a ” section, ” for example only a third of a beam length, then the increase from thermal expansion would be correspondingly smaller (or 0.7 inches). This makes NIST’s story of all those bolts and studs breaking in unison, and that critical girder buckling, quite unbelievable. But how did the beams reach 600°C in the first place? In the real world, this would have required very hot fires for a very long time. In NIST’s computer, of course, this was not a problem. As with the report for the towers, these cyber-space investigators only needed to fudge a few numbers, like the thermal conductivity of the materials involved. Structural steel has a thermal conductivity of 46 W/m/K, which means that any heat applied is easily wicked away. But if that value were set to zero, or near zero, any heat applied would allow the temperature to rise dramatically at the point of application. Fudging the thermal conductivity values, and extrapolating the localized computer results across vast sections of the building, appears to be how NIST scientists convinced themselves that they could promote the high steel temperatures. But also note that raising those five floor beams to a temperature of 600°C would require an enormous amount of energy, far more than was available from the burning of the office furnishings underneath the floor beams. Of course, NIST has not had any trouble selling such leaps of imagination before, as its media sponsors don’t ask detailed questions and NIST does not discuss its reports with independent investigators. Further problems for NIST’s new story result from admissions NIST has made about the state of the fires in the building, and the design of the structure. NIST admits that the fires in WTC 7 were typical office fires, and that the fires could not move from floor to floor. NIST also admits that the building was designed to comply with New York City Building Code, requiring fire resistance of 3 hours for columns and 2 hours for floors. Add to these facts that NIST admitted in their December 2007 advisory committee meeting that the fuel load could only support 20 minutes of fire in any given location. For floors 11 and 12, NIST increased this estimated fuel load from 4 lb/ft 2 to 6.4 lb/ft 2 , presumably giving a new maximum fire time of 32 minutes. Even so, how then did NIST come up with fire times of 3.5 to 4 hours? What could possibly have been burning, under those beams, for another three hours? Without answers to these questions, we must assume that NIST is now suggesting specific corporate culpability for the failure of WTC 7. To sum up, steel components that were certified to withstand hours of fire failed in typical office fires lasting a maximum of 32 minutes in any given location. That means that there must have been negligence, or extremely poor performance, on the part of those who ensured the fire resistance of the structural components. With the report on the towers, NIST pretended that it was a mystery as to who tested the steel components for fire resistance. But, in fact, it wasn’t actually that much of a mystery unless you asked UL while the whole country was watching. 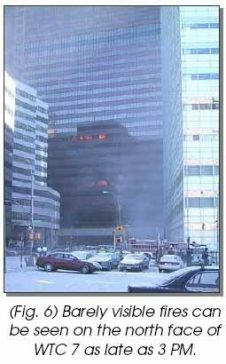 24 But for WTC 7, NIST comes right out and says that UL was the firm that provided the fire resistance information for the building. That’s one good reason why UL is not listed as being part of the WTC 7 investigation. Having the company that was responsible for establishing the fire resistance of the building participate in the politically motivated investigation into how the building failed from fire might just be a conflict of interest. The problem NIST and UL have now is that confirming UL’s involvement in the WTC 7 design, when the official story is centered only on failure by fire, could lead to greater problems for UL. It is clear that UL must now answer for how the structural components of WTC 7 failed catastrophically, in typical office fires, when UL’s Fire Resistance Directory reported that these components would resist fire damage for much longer. After years of talking about diesel fuel fires and damage from the towers being the causes of the near free-fall collapse of WTC 7, and then acting as if they just couldn’t get a handle on it, NIST now has a new “obvious” story. The new story is based on a “new phenomenon” of thermal expansion whereby fully insulated steel beams are exposed to temperatures of 600°C in only 32 minutes. Believe it or not, NIST actually says this happened in only a few seconds (NCSTAR 1-9, table 8-2, p 353). This extreme temperature, which did not weaken the beams at all, as would have happened in WTC 1 or WTC 2, broke all the shear studs, seat bolts and clip bolts on all the beams of the east wall of WTC 7. The beams then expanded linearly, pushing the girder between column 79 and column 44 by a maximum of 2.2 inches, causing that critical girder to buckle and fall away from columns 79 and 44. We have seen that this ” initial local failure ” is not realistic. This is because the fire times could not possibly have caused the high steel temperatures cited, the steel would not have remained rigid if those temperatures had been reached, and the very slight thermal expansion would not have been great enough to cause the extensive girder damage imagined by NIST. From that tenuous position, we are led to believe that the one fallen girder caused one column to buckle and that meant the total destruction of this 47-story building in a matter of seconds. But who could have predicted all of this? NIST admits that this is a rare phenomenon that it had to work hard to prove. What geniuses knew that this new phenomenon of the thermal expansion of several floor beams in unison would cause this one hair-trigger girder to bring the entire building down several hours before it actually occurred? First, NIST asks us to assume that it wasn’t a planned demolition. We are led to believe that no one would have placed explosive charges around the entire building to cause what appears to everyone who sees it as a completely symmetrical and purely vertical near free-fall implosion. On the contrary, NIST says that if WTC 7 was to have been a demolition, it would have to begin with an assumption that most of their new story is correct. That is, anybody wanting to bring the building down in a demolition event would have obviously placed one gigantic bomb under that one all important column – column 79. Therefore, let’s play along with this dishonest pretense and see what NIST says that would do. Essentially, NIST is saying that WTC 7 was not a demolition because a big boom would make a big sound. That, ladies and gentlemen, is the culmination of seven years of Bush Science. The 9/11 Commission told us that the attacks on September 11 th succeeded ultimately because of a “failure of imagination.” NIST will never be accused of that kind of failure, as its new WTC 7 report is nothing but imaginary tripe. This new story contradicts the previous major claims by NIST, ignores the most important of the existing evidence, produces no scientific test results to support itself, and is so obviously false on its face that not even a fictional character from another planet would believe it. Fires that could only last 20 to 30 minutes lasted 4 hours (what was burning?). Imaginary temperatures that, according to NIST would have easily weakened the same steel in the towers, left beams fully rigid so that they could push one girder a full 2.2 inches, somehow breaking numerous bolts and studs in unison, as well as buckling the girder, before the beams themselves were affected in any way. Suddenly this one girder failure caused numerous floors to collapse, one hair-trigger “switch” column to buckle, and the whole building to fall in a total of 8 seconds. NIST tells us that most of these unprecedented, illogical and thoroughly fantastic events were happening within the box of WTC 7 itself, before we saw anything. Of course, they have absolutely no evidence for any of these things happening in the real world. But by now we know that it doesn’t matter. The Bush scientists only need to keep their bosses’ sadistic political story viable for a few more months. 20 For the 60 FDNY reports, see Graeme MacQueen, “Waiting for Seven: WTC 7 Collapse Warnings in the FDNY Oral Histories,” Journal of 9/11 Studies , January 2008. For the warning given to medical responders, see History Commons (9/11 Timeline), http://www.historycommons.org/context.jsp?item=a430wtc7evacuated . For CNN and BBC, see WTC7.net, http://www.wtc7.net/foreknowledge.html . 25 For the 60 FDNY reports, see Graeme MacQueen, “Waiting for Seven: WTC 7 Collapse Warnings in the FDNY Oral Histories,” Journal of 9/11 Studies , January 2008. For the warning given to medical responders, see History Commons (9/11 Timeline), http://www.historycommons.org/context.jsp?item=a430wtc7evacuated . For CNN and BBC, see WTC7.net, http://www.wtc7.net/foreknowledge.html .